My current passion - turning my favorite ice cream flavors into delicious, cakes. I've had this recipe for several years and I can honestly not remember where it came from originally. I converted it from a two layer cake to a three layer cake because lets face it, when it comes to cake, bigger is better. Pour into three 9” cake pans. 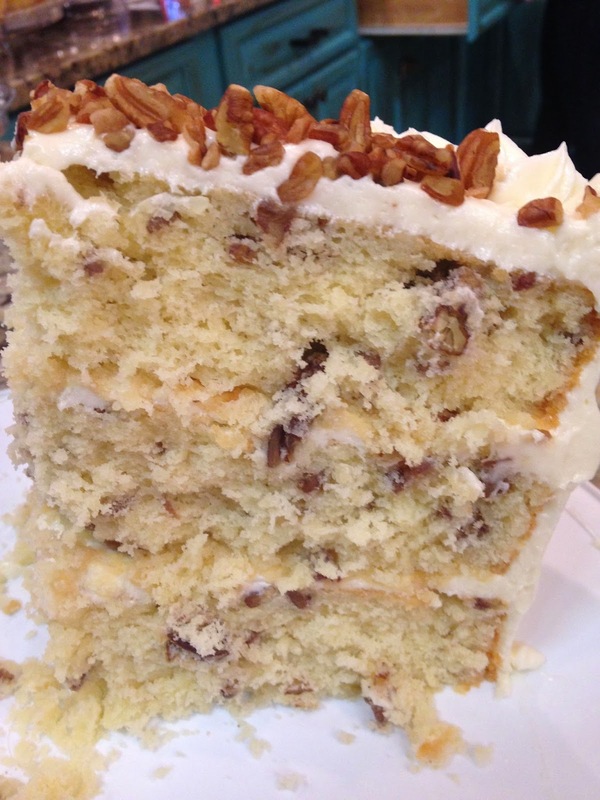 Press additional pecans into lower edge of cake and decorate with piped swirls and pecan halves on top of cake. Now all of you butter pecan ice cream fans can enjoy your favorite treat even when the ice cream shop is closed. Enjoy friends. This cake was really good! I made it to take to work for a coworker's birthday and the entire cake was gone! Thank you for sharing! I am so glad that your cake was a big hit. Thanks for stopping by my blog.